The second biggest event at Star Wars Celebration Chicago after the Episode IX reveal on Friday was without a doubt the panel presentation for “The Mandalorian” on Sunday morning. The series will premiere on November 12th when the Disney+ streaming platform goes live. It’s the first live-action "Star Wars" television series, something that has been mentioned on and off for decades. The fact that the show revolves around a mysterious character with a recognizable fan-favorite look certainly increases the growing curiosity around the project. Around the time the prequels came out, George Lucas mentioned how he envisioned "Star Wars" branching out into an episodic television format, with both an animated and live-action series. The animated series happened in 2008 with the hugely successful “Clone Wars” (it ran six seasons and will be continuing this fall on Disney+) from producer Dave Filoni and now we have "The Mandalorian," a series created by writer/executive producer Jon Favreau with help from Filoni and some intriguing directors such as Bryce Dallas Howard, Deborah Chow ("Jessica Jones"), Rick Famuyiwa ("Dope") and Taika Waititi. The anticipation for the event was obvious as fans trickled into the WinTrust Arena from the cold and rainy streets of Chicago (an atmosphere that felt ironically like Kamino, the rain-soaked planet from “Attack of the Clones” and would later feel like the snow-swept planet Hoth from "Empire Strikes Back") as DJ Elliot once again threw down some pulse-pounding beats to get the audience hyped. After three days of coverage, I wasn't the only one fatigued, yet master crowd carouser Mark Daniel was back cruising up and down the aisles of the arena floor, interacting with fans and giving away "Star Wars" swag. He was then followed by actor and veteran host, Warwick Davis ("Return of the Jedi", "Solo: A Star Wars Story"), who brought people up on stage to play fun "Star Wars" games as the clock counted down to the panel's start time. Both Daniel and Davis pointed to a specific section of fans on the main floor, all of whom wore their own custom-made Mandalorian armor to the event. They could be seen standing up and raising their helmets in the air, as if performing bounty hunter zumba. Apparently most, if not all of them, are part of a non-profit group called The Mandalorian Mercs. I couldn't make out what exactly their group function is, but it was clear that unity and diversity was their emphasis, along with a love for the specific Mandalorian look, originated by bounty hunter Boba Fett, who become a fan-favorite despite having zero lines when Darth Vader hired him in "The Empire Strikes Back." When the lights went down, the crowd went nuts, and out came the trio chiefly responsible for the new show, producer Kathleen Kennedy, Favreau and Filoni. Kennedy thanked everyone for the overall reception at Celebration this year, and how excited she was for this particular panel. She then handed over the presentation to Favreau and Filoni, both of whom went on to share how they met long ago at Skywalker Ranch, where Favreau was mixing "Iron Man" and Filoni was working on "The Clone Wars." Filoni shared how he was the first person to see the final cut of "Iron Man." The two hit it off and eventually came together on this project as executive producers, with Favreau writing and Filoni directing a couple of episodes. They explain that "The Mandalorian" is set approximately three years after the fall of the Empire in "Return of the Jedi" and before the ascension of the First Order in "The Force Awakens," when small factions of the Empire remain and chaos has erupted after the celebration of the rebellion. This could be the first time a Star Wars storyline exists outside the Skywalker saga, which is certainly something fans have been hoping for. The executive producers then brought out three of the stars of the new show, Pedro Pascal, Gina Carano and Carl Weathers, all of whom received a rousing ovation. Favreau had each actor introduce what their roles are as brand new images of their characters appeared above them, both concept work and stills from "The Mandalorian." Pascal is the titular lone gunfighter who resides in the outer reaches of the galaxy. "He's got a lot of Clint Eastwood in him," Pascal explains, "Some may say he has questionable moral character, which is in line with some of our best westerns." This makes sense considering Favreau and Filoni described how the overall vibe of the show was heavily influenced by old Westerns and samurai films, both of which served as inspiration for Lucas as well. Carano expressed her excitement at the crowd's reception, stating, "I get to be part of a whole other family" in her role as Kara Dune, an ex-rebel shocktrooper who she describes as "a bit of a loner, which isn't a far stretch - and I'm having a bit of trouble reintegrating into society." When an exuberant, bearded Carl Weathers came out, he shouted, "I want you! I want you!" (a line associated with his iconic Apollo Creed character from the "Rocky" franchise) out to the audience. Weathers then sat down and shared how he's playing the head of a guild of bounty hunters who's looking for someone to deliver a valuable product to a special client. 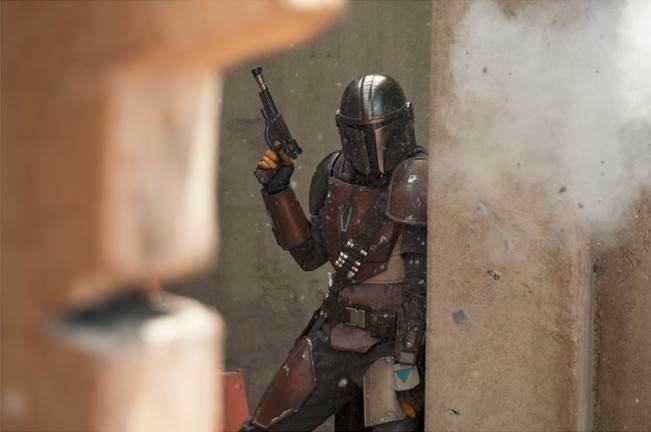 Greef chooses the Mandalorian because "The Mando does what needs to be done," the veteran actor stated with a sly grin. At this time during the event, Favreau admitted it was time to show footage and what we were about to see would be blacked out for livestream viewers at home (I found out later it was even omitted from the two overflow stages this was being broadcast at the McCormick Place). The first thing we see is the Mandalorian meeting Greef at a cantina bar familiar to the "Star Wars" universe, presumably filled with nefarious types. The Mandalorian watches as Greef shuffles through curious pucks which represent bounties. 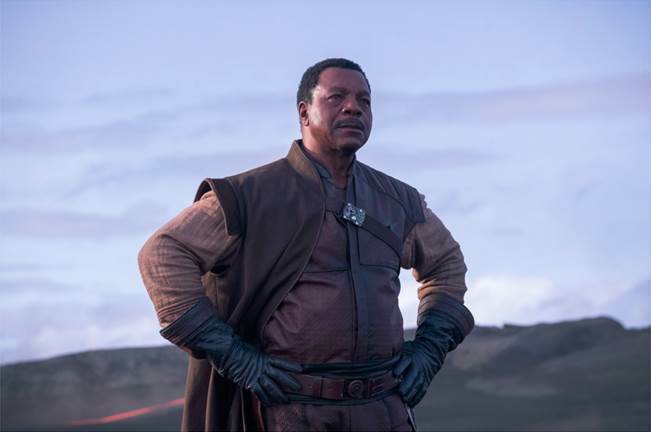 When The Mandalorian indicates he's looking for something with a higher bounty, Greef points out that he has a job in mind, but he'd have to send him off to get further instructions from someone with deeper pockets. We then follow the Mandalorian through a lively marketplace where a caged Salacious Crumb-type creature looks on in horror as one of his kind has turned into rotisserie. The Mandalorian makes his way to the exterior of his destination where a gatekeeper droid (similar to the kind that questioned Threepio outside of Jabba's palace in "Jedi") scans a card he holds up. This opens the entrance and the gunslinger is led inside by a gonk droid. Another door opens and then the Mandalorian is face-to-face with a room full of four stormtroopers who stand alongside a character played by none other than Werner Herzog. As this sketchy, self-described pragmatic character tells the Mandalorian about a job he has, they are interrupted by an anxious doctor (Omid Obtahi) who enters from a side door and proceeds to disclose too much information. The situation turns into a sudden standoff, in which all the troopers point their blasters at the Mandalorian. A trooper emphasizes that he's outnumbered, to which The Mandalorian answers, "I like those odds." The situation is calmed and the discussion of the job reconvenes, as Herzog calmly explains that the target can be delivered alive or dead, much to the doctor's chagrin. We don't find out who the target is, but we see Herzog unveil a rectangular piece of iron he refers to as a Beskar as downpayment. This footage wraps with the Mandalorian cautiously walking out with his downpayment, off to fulfill his assignment no doubt. The best part, besides seeing Herzog in the "Star Wars" universe, is how we never see Pascal's face ... that recognizable bucket helmet stays on his head the entire time. In fact, it stays on throughout every bit of footage we see. That's quite reassuring considering there's typically a tendency to show an actor's face whenever they're playing a character wearing a mask or helmet. Thankfully, there is clearly an effort to maintain the mystery and anonymity of the character. 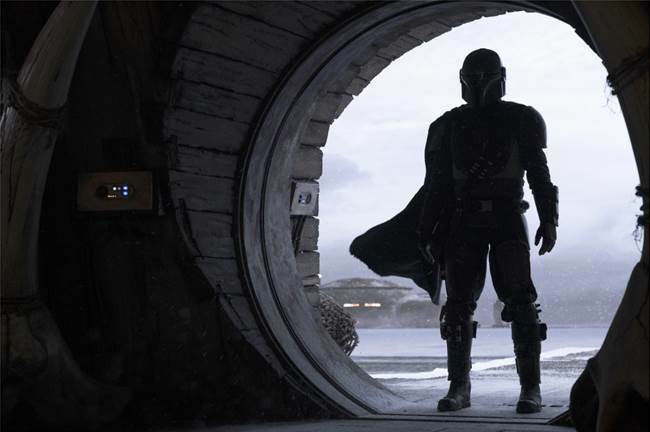 This sequence was followed by a montage of what to expect from "The Mandalorian," where we catch glimpses of the various characters, aliens, vehicles and locations we can expect to see on the show. The audience cheered as they recognized Giancarlo Esposito ("Breaking Bad") in a supporting role as what looks like an Imperial character who leads a group of Death Troopers and even flies a TIE fighter. I do believe I also noticed Nick Nolte in the background, knowing he's also part of the cast. Of course, the crowd went absolutely crazy with this footage and with good reason. It looks exciting, mysterious, and unlike anything we've seen before, despite being set in the Star Wars universe. The production values carry the gritty, lived-in look we've come to expect from the kind of morally questionable and nefarious characters that inhabit this section of the galaxy. Favreau and Filoni explained how viewers will see new planets, vehicles (the Mandalorian's gunship is called the Razorcrest) and species as they intend to include elements from the original trilogy, prequel trilogy, along with aspects from the "Clone Wars" and "Rebels" television series, as well as bits from the Expanded Universe. Favreau also shared some informative behind-the-scenes footage (which he said was okay for viewers to record) and added that this was the first time a Star Wars production was shot in Los Angeles, using cutting edge technology while keeping the practical and handmade effects the original movies were known for. They also shared how the 501st Legion got involved in the production in order to fill out episodes with authentic-looking stormtroopers. When a call went out for stormtroopers, this international fan-based organization known for their detailed hand-crafted costumes volunteered their time as glorified extras during filming. Favreau shared how none of the volunteers were initially told what they were being asked to do. Filoni laughed, stating how members thought the request was for the kind of gatherings and functions they're typically called to participate in. Both of them shared how impressed they were with the 501st, as Carano adding how legit they are and Weathers stating how hard the men and women worked on set. I'm sure there will be skepticism surrounding a live-acton "Star Wars" television show, but being there and witnessing that first footage, I was and remain sold. A "Star Wars" space western, inspired by Sergio Leone and Akira Kurosawa? Sign me up.